Hamstring strains are one of those stubborn injuries that far too often become recurring injuries or more chronic strains. Their high rate of recurrence is often times due to a lack of careful rehabilitation and training following the injury. If you are experiencing chronic hamstring strains, there is a specific and well understood way to begin to exercise the injured body part and progress back to full athletic participation. Acute Phase Considerations: Did you just injure your hamstring, or is it currently painful? The first step in rehabilitating insulted muscle tissue is to find ways to use this muscle without causing further injury. Isometric exercise is defined as a muscular contraction where the muscle length is not changing. In other words, the muscle is being flexed, but it is not creating any movement. An example of an isometric exercise is showing off your arm muscles or flexing your abs as hard as you can. Isometrics have been shown to help with pain and are an effective initial way to start exercising after injury. The bridge position is good place to start with isometric hamstring exercise. Isometrics have numerous applications in strength training as well as rehab. They are an effective way to warm-up and prime muscles for movement as well as decrease sensitivity and pain after injury. Isometric contractions allow the athlete to recruit a maximal amount of muscle fibers and can help to optimize the nervous system for efficient muscular contraction. This process is often called “activating” muscles and is done prior to strenuous lifting. In addition to activation, isometric strength training develops strength that is extremely specific to the range of motion trained. This can be helpful in training weak points. For example, isometric holds in the bottom of a squat (pause squats), or isometric deadlift holds just above or below your sticking point can help bust plateaus. In addition to the physiological benefits of pain relief, the increased neuromuscular recruitment efficiency, and the practical strength training application of isometrics, they can be extremely helpful in teaching exercise progression and introducing new movement. For example, in the bridge progression chart below, you must complete an isometric hold of each new challenging position before you do it for reps. During rehab, there might be a session where you do the dynamic movement of one position and the isometric holds from the next most challenging position. This is how you can slowly advance the difficulty of rehab. Isometrics allow us to “feel out” new ranges of motion. They’re helpful for teaching lifting for this same reason as for rehab. They are a useful method of self limiting progression to ensure we do not push ourselves too much and take a step back as well. Isometrics build the initial strength and comfort in each new range of motion. Phase 2: begin to increase bridging distance. Bridge walk-outs start here. Moving the feet further away makes the bridge more hamstring intensive. Start all new positions with isometric holds, then progress to reps and movement. Build from 2 sets x 5-8 reps to 3 x 10-12 before entering each new phase. Use pain and form as your guide for progression. Get the Squat Mobility Checklist FREE! Join thousands receiving weekly updates on the best movement & mobility practices from TheBarbellPhysio.com and get a free download of my "Squat Mobility Checklist" for Free! If the phase 0 bridge is painful, there are a few ways to modify the exercise and experiment with finding pain free movement. Range of motion can be altered in order to reduce the strength of the contraction. Introducing extra isometric resistance in other planes of movement can help to recruit varied musculature and significantly alter pain sensation. Additionally there are pelvic and core positioning cues and considerations that can be used to find pain free movement. A posterior tilted pelvis and flexed spine positioning can effectively shorten the length of the hamstrings and increase contraction strength. This is one cue that can help to decrease sensitivity during the initial phase and also train the core to prepare for proper positioning under load later on. Are you stretching your hamstrings too much, too soon? One very common misconception is that tight feeling muscles need to be stretched. Muscles can feel tight for a variety of reasons, and it is not always necessary or even beneficial to stretch a muscle. Sometimes, it can even be detrimental to its recovery. During most muscle injuries, the fibers or microscopic cells are slightly torn. In extreme cases where bleeding is excessive, this can be seen in the form of bruising, swelling, and highly sensitized painful tissue. Insulted tissue responds much better to gentle exercise and movement than it does vigorous stretching. If this has been your method of relieving pain, you are in for a rude awakening. Stretching a muscle can create a temporary inhibitory effect on its fibers, causing the tone of the muscle to relax and thus allowing for more range of motion. Muscle length is a fluid and dynamic quality that changes based on the status of the nervous system and muscle fibers themselves. For example, if your hamstrings are extremely stiff after a killer deadlift workout, their fibers and cells are highly sensitive and do not want to be tugged on and stretched. Therefore, your nervous system knows this and disallows intense stretching. Your muscles did not physically shorten over night, and if worked back into range of motion properly, they will return to a comfortable resting length once the soreness is resolved. After a hamstring injury, there are some gentle stretching and mobility techniques for the hamstrings and posterior chain that can be helpful. Some gentle mobility is OK, but this should not be a rehab focus until basic movements like lunges, squats, and bridges are pain free and mobility is seen as a limiting factor. For many, a properly performed lunge or single leg deadlift is a mobility movement by itself. Make single leg strength training the priority, not just stretching. Here is a video of some gentle stretching techniques that can be used. Incorporating hip rotation into stretches will ensure the entire hamstring group is stretched equally. Hamstring rehabilitation involves feedback and monitoring of pain and feeling in the hamstring. The more in tune you are with your body, the better your recovery and rehabilitation will go. It is important to be honest with yourself and be disciplined here, as it is human and athletic instinct to want to constantly push yourself. Testing limits is OK and necessary. It just needs to be done correctly with the proper thinking and feedback mechanisms. The goal is to continually add progressions and challenges to the exercises while being able to distinguish between good pain, working muscles, stretch vs. pull, and bad pain. Good pain during a hamstring rehab is a slight stretch, or a very small pulling feeling that improves throughout the exercise or set. Good pain is muscular soreness afterwards. Bad pain is a strong or painful pull, a tug, and any strength of contraction that would not be able to be tolerated for a 5-10 second hold. If you are working with a patient, come up with some mutually shared ways to communicate about stretch vs. pain vs. pull, good vs. bad pain, etc. Athletes require more advanced ways to increase the strength of their hamstrings and move beyond the basic bridge and isometric progressions. Unilateral exercises can teach body stiffness, core control, balance, and controlled eccentric lengthening along with reciprocal hip movement. They can be beneficial for all athletes including barbell lifters. Developing single leg strength is markedly different than lifting with both your feet on the ground, it will make you stronger and more resilient. These exercises are sure to challenge even the healthiest of hamstrings. The single leg deadlift should be in everyone’s training program. It’s a key move for combining hamstring mobility and strength into one movement. All of these exercises can be progressed with speed as well as weight. 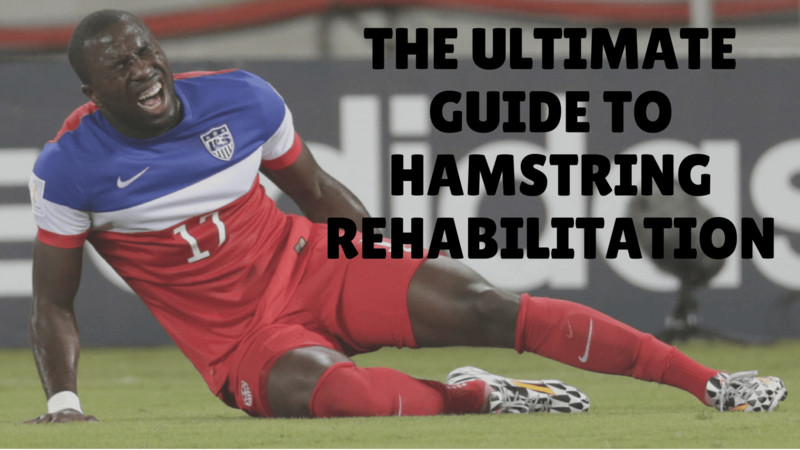 Hamstrings are called up on to contract quickly and need to be rehabbed accordingly. The band pulldown recreates the cyclical motion of gait with the swing leg. It can hard very quickly with ample band tension. This exercise also challenges the core and pelvis in a more generalized way to stay level and not get torqued by the band. Lunges involve much more hamstring activity when they’re done with sliders. Like all of these exercises, increasing the speed makes this significantly more challenging to the hamstrings. At this point, the athlete should be able to resume normal lifting that does not stress the hamstrings. This exercise list includes more shallow range of motion squats with forward knee bend, think of a front squat or goblet squat. Pushing a sled can also be great during this time. The concentric work of a marching sled push can be a very effective way to tax the hamstrings. The hamstrings require a high amount of stiffness in order to propel the body against a sled pushing forward. This can also serve as an ongoing assessment tool for physical readiness. The sled should be taxing but tolerable for hamstrings. Any sort of deadlifting or posterior chain dominant work should be progressed under the previously stated rules as well: gradually increasing range of motion, load and speed. If we want to explore the “WHY?” question as to hamstring injuries, we might want to look at two different areas: the opposite hip flexor and the same side glute. During gait or running, as the hamstring is lengthened, so is the contralateral hip flexor. If you are having recurrent hamstring issues, you might want to look at opposite anterior chain. Poor hip extension on one hip can make hip flexion of the opposite hip more difficult, thus affecting the hamstring. In order to asses hip extension and tight hip flexors, we recommend performing the THOMAS TEST. Here is an example of an active thomas test that you can do yourself to asses hip flexor mobility and control as well. Use a box or raised bench if you don’t have access to a table. The glutes and hamstrings play synergistic roles as powerful extensors of the hip. It would stand to reason that if one glute was weak, for whatever reason, that side hamstring might have to take on more load. Training hip extension with both glute and hamstring dominant movements is just as important as training knee flexion in the rehab process. In order to address glute strength: check out THIS ARTICLE for different exercises to throw into the mix. Lastly, one important test to help look at proper hip function and screen out for future hamstring issues is the standing hip flexion hurdle test. The hurdle test is part of a movement screen that can be helpful for bringing to light hip pathology or movement deficits in active flexion that might impact gait and running mechanics. The video below shows 3 common compensations: trunk sidebending, hip hiking, and then hip rotation compensations. One thing to notice with the hip rotation deficits is the concomitant compensations with foot eversion and inversion. Often, we find individuals with difficulty controlling pelvic positions (core stability) will place their pelvic in an anteriorly tilted position during athletic movements. Many times, working on better controlling pelvic positioning can have a great effect on decreasing strain on the hamstrings. Here are some of our favorites but you can get creative here! Psoas March and Variations are great to work core and hip flexor strength simultaneously with a focus on controlling pelvic positioning. Dead Bugs and Variations are a killer series of exercises to get your core seriously strong. Band Pullover Straight Leg Raises are great to stabilize the core/pelvic while taking the hamstring through its full range of motion. Returning to jogging after a hamstring injury usually isn’t too bad. It’s the sprinting and high velocity work that is both challenging and daunting. This can be especially true for athletes who injured their hamstrings running at full speed. There are two ways that I like to modify the running gait during rehab. Running up a hill effectively shortens the stride length and is a safe way to progress to a 100% effort sprint. I always recommend starting max effort running on an incline. The second option is to do sprints while dragging a light sled. Start around 20% body-weight and work your way down. Decreasing weight is a progression for sled sprints. With increasing speed, the hamstring will be contracting faster and moving with a greater range of motion. Both of these methods reduce stride length, and maximum velocity for sprinting. They can also be helpful for reviewing and teaching sprinting mechanics. An example of how a sled drag progression might look is to gradually decrease the weight over 3-4 weeks to return unweighted sprints. With hill sprints, the hill volume can gradually subbed in for flat ground sprinting until the sprinting volume is all on flat ground. Proper conditioning is critical when returning from hamstring injuries. A fatigued hamstring is a weak one, and this can make it susceptible to re-injury. Conditioning of the muscle itself is just as important as the cardiovascular system The hamstring needs be repeatedly conditioned for max velocity running gait. A significant part of rehab for high level athletes is getting back the endurance to maintain a high level of performance over the duration of a game or practice. It is for this reason that cardiovascular conditioning should be maintained as much as possible during rehab. Tempo running and a gradual return to running and practice drills are helpful. Oftentimes athletes want to re-condition by jogging, they’ll go out and run 4 miles in 30 minutes and think they’re helping their hamstring. Jogging is not sufficient. That’s an 8mph pace. During a competitive event, most high level athletes (men & women) will be achieving speeds between 14 and 18 mph. Hamstring injuries happen during higher velocity running and these conditions must be re-created in rehabilitation in order to fully prepare the athlete. During a tempo run the athlete should be briefly hitting 10-12 mph and should strive for a full cycling range of motion similar to max velocity running. By the time the athlete is returning to practice and movement they should be well conditioned, extremely in touch with their body, and constantly self monitoring to avoid extreme fatigue and scenarios that can potentially cause a re-injury. Returning from a muscle pull or tear requires self limiting behavior and discipline: pain is subjective and the athlete is the only one that knows how they feel. One nice way to do tempo runs is on a woodway curve. The curve gives you a speed reading and allows you to run as fast as you like and easily accelerate to 10 or 12 mph. If you don’t have access to this kind of equipment, any field or open area will do. A normal belt powered treadmill is not ideal for tempo runs. Using a radar gun to gauge the athlete’s speed and assign objective numbers is a helpful way to control tempo runs on the field. This is the hardest part, and it’s where the most injury recurrences and mistakes happen. Conditioning is extremely important, this non-negotiable. One session with a few 100% effort sprints at the end does not equate to being physically ready for full game play. This 100% effort must be sustained for longer and longer each session. Film and slo-mo video can be helpful here to analyze running form. Pick one thing to analyze each time you watch and compare side to side. Look at front-side mechanics: how’s the knee drive? Back-side mechanics: where does each heel end up, are they getting full extension? This video analysis is an objective way to look at the athlete’s physical readiness. There are some other locomotive ways to challenge the hamstring in the last part of rehab. Bounding running, galloping, and running downhill or overspeed running will increase the stretch on the hamstring and potentially expose the injured area. During this last phase of rehab you need to expose the injury in order to ensure it’s strong enough for return to sport. This concept of exposing and protecting the injury is what the entire rehabilitation process is based on. At first we protect while the injury heals, we then expose by strengthening the insulted tissue. In later rehab, we expose by increase running speeds and introducing new stimuli, while we simultaneously protect through modifications like sled drags and hill running. Expose vs. Protect, that is the continuum that all rehabilitation is based on. Dr. Teddy Willsey is a sports medicine physical therapist and performance coach at Healthy Baller Speed & Performance Center. Healthy Baller is the premier strength and conditioning and rehabilitation sports medicine center in the Washington D.C. metro area. As a former high level powerlifter and strength coach himself, Teddy specializes in bringing strength & conditioning principles to the rehabilitation world and filling the void that often exists between therapy and training.